Q. Explain your feelings in the match. What happened? RAFAEL NADAL: I played bad. That's all. Disappointed with the way I played. But that happens sometimes. Can happen, and it happens. I did all what I had to do to be in good shape. I worked very hard for the last week, week and week and a half. After Rio I had a few days off, three days off, to recover the back. Then I think I worked great. I think worked great and with good feeling. But since I started the competition here I didn't find the right feelings. It's true that I played against two opponents that probably didn't help me to get the rhythm in the tournament. But that's it. I was there. I saved tough situation the first day. Today I was close to save another one. But at the end, when you are on the limit, this thing happen. You can lose. I lost today. Congratulate him. He played I think better than me. That's it. Life continues. Gonna keep working hard to try to be ready for Miami. RAFAEL NADAL: I served much better today than the other day. RAFAEL NADAL: I am better with my back, so it is not a question with the back. Q. Recovering from that pain, though, is it tougher playing Stepanek, Dolgopolov? RAFAEL NADAL: No. Forget about the back. I don't want to talk anymore about the back because I am fine with the back. I didn't have bad feelings with my back. The bad feelings was with the forehand and with the backhand (smiling). That's the really thing. It's not the day to‑‑ well, never is a day to find excuses when the things‑‑ when you have something that limit you, you can say. When nothing limit you and you play bad, you have to say. I played bad. This is a tournament that I really love so much. I wanted to play very well here. I had good success in this tournament in the past, a tournament I always have great feelings. I had great feelings practicing. I never find a good feelings when I was on court competing this year. Upset for that, because as I said before, I love a lot this event. That's fine. It's impossible to be every single week on the last round of the tournament. I did for the first three tournaments of the year that I played. Today was an accident. I lost. Gonna keep working hard to try to be ready to play better in Miami. Q. The great thing about tennis, or one of it, is that it's a cycle. In less than a month or so the tennis will turn to the clay season. You do so well on the clay. You feel so comfortable. Could you talk about what your feelings are when the clay season comes around, what you feel inside, and do you think you should be favored as the favorite for the French Open? RAFAEL NADAL: I won on clay when I was playing well on clay. If I am not playing good tennis, doesn't matter if it's clay, hard, grass, or I don't know, new surface. (Smiling). I had a lot of success on clay during the last probably nine, ten years. It's obvious that is a surface that probably help me to find the right feelings. But clay doesn't mean success. Is a surface that I know how I have to play. In the end, it's a tennis court. If you are not playing at the top level, I don't going to have success on clay. Happens the same this year than years in the past. And talking about French Open, remain a lot about the French Open. My goal is try to be one of the candidates. To be one of the candidates, I need to play well in Monte‑Carlo, Barcelona, Madrid, and Rome to arrive with the right feelings. That's what I gonna try. Q. You played him recently. He's never beaten you. Did you find that he was doing anything different tonight tactically against you? RAFAEL NADAL: You know, is difficult to say, but break for me, another break for me in the first; another time that I lost my serve, two times at the beginning of the match. When I have two breaks in one set, normally I don't lose the set. He played great. He's playing well, much better today. Had good tournaments in Rio, in Acapulco, so great what the things that he is doing. But today. At the end I have to analyze my part and opponent. I cannot talk about the opponent because what the opponent does is not in my hands. I can talk about what is in my hands, and what is in my hands I didn't play enough solid today. I had enough breaks to win the match, but I didn't play enough well from the baseline then to be solid with my serve. Is not a problem with my serve. Was more problem with my baseline shots. I didn't go for the points. I played with too many mistakes. So when that happens, you know, when you are playing a player like Dolgopolov, the way to stop him and the way that I really bother him is when I am solid all the time, playing long, playing high. When I play a high ball and the ball comes short, I go for the point and try to hit a winner and I open the court all the time. So he's in trouble, no, if I play defensive, if I play short, if I hit good ball. But when the ball comes back short I am not able to have the winner or to play a shot that gonna give me that advantage. So then the match ‑‑then I become a really normal player. I am not anymore a great player. I am a great player when I am doing these kind of things. These kind of things I am not doing the last two days. So when I am not doing these kind of things, I am not that good player. I become a normal player. That's it. Q. I know you have talked a lot about the importance of every tournament that you're in, one at a time, but Miami is the one next one of the Masters you haven't won yet. I wonder if there is going to be a special sort of urgency. 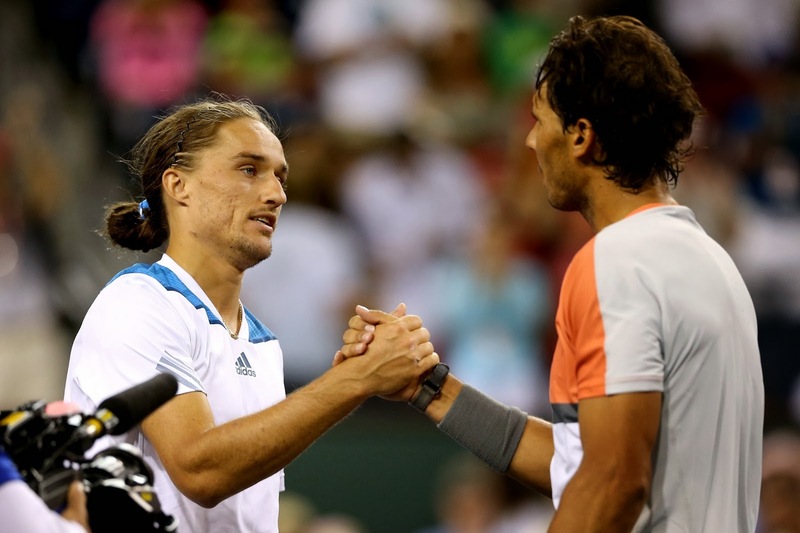 RAFAEL NADAL: Urgency? No. At the end I love every tournament I gonna play. I play with the same intensity when I am playing 250, when I am playing 500, when I am playing a 1000, or a Grand Slam. I don't know how to play tennis different way, 50%. I play with all 100%, all my 100% every week. Today my 100% was here; sometimes it's here. But I played with my 100% today was not enough. I gonna play with my 100% in Miami. Let's see if my 100% in Miami still here or is here. Q. You said you had good feelings in practice coming into the matches. So is it unusual that you are feeling very good in practice and then when you get to the match you don't find the same level? RAFAEL NADAL: Yeah, is unusual. RAFAEL NADAL: When I am practicing well, normally I play well because I am a good competitor. That's what happened most of the times in my career. Maybe I'm not a good competitor anymore (smiling). I am joking. Is not drama. Is lose. I accept that. Try to rest few days and be fresh mentally, and I hope to be ready for Miami.